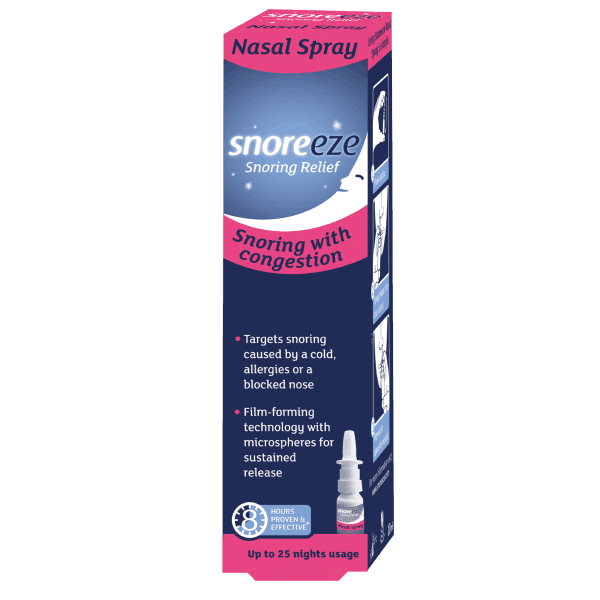 Snoreeze Nasal Spray targets snoring caused by a cold, allergies or a blocked nose. Its unique blend of natural active ingredients coats the nasal passages and opens the airways to provide effective snoring relief for up to 8 hours. How does Snoreeze Nasal Spray work? 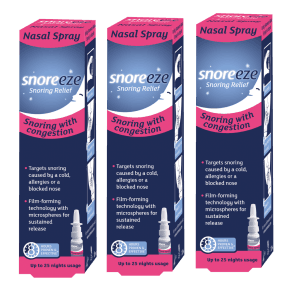 Snoreeze Nasal Spray targets snoring caused by a cold, allergies or a blocked nose. Its unique formula creates a fine film in which microspheres slowly release the active ingredients. This film hydrates the nasal passages, reducing the vibrations that cause snoring for up to 8 hours. 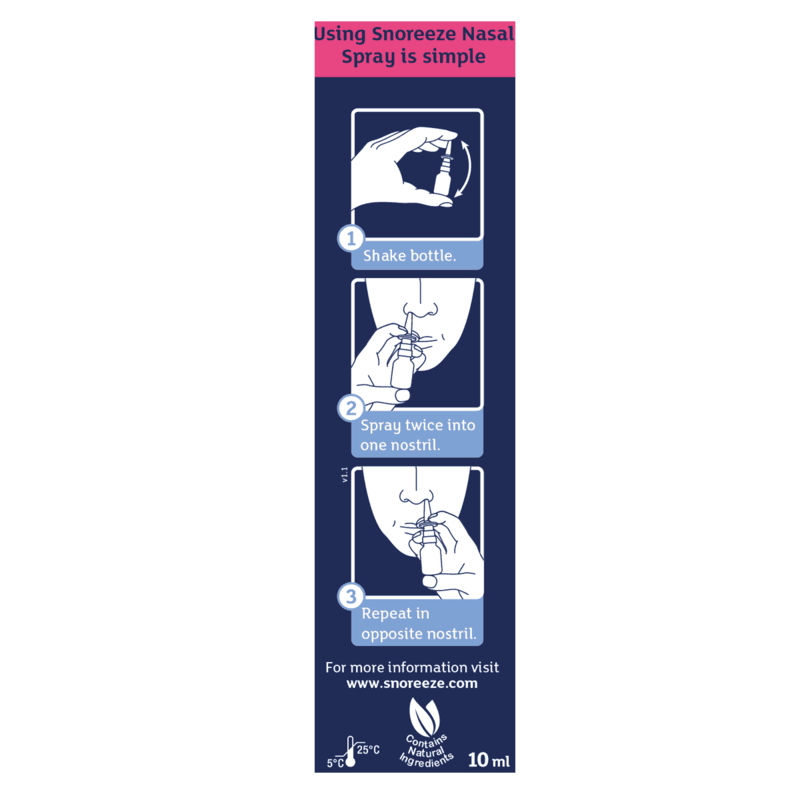 Snoreeze Nasal Spray is available in 10ml providing up to 25 applications. More than one application of Snoreeze Nasal Spray can be taken, but usually one application is enough. Keep out of reach of small children. Spray pump contains small parts. Store in a cool, dry place below 25°C. Snoreeze Nasal Spray should be used at room temperature. Snoreeze recommends that if you are pregnant or breastfeeding you should contact your doctor before use. Please note: There is no guaranteed ‘cure’ for snoring. However, Snoreeze Nasal Spray can relieve the symptoms of snoring to help provide a peaceful night’s sleep for you and your partner. 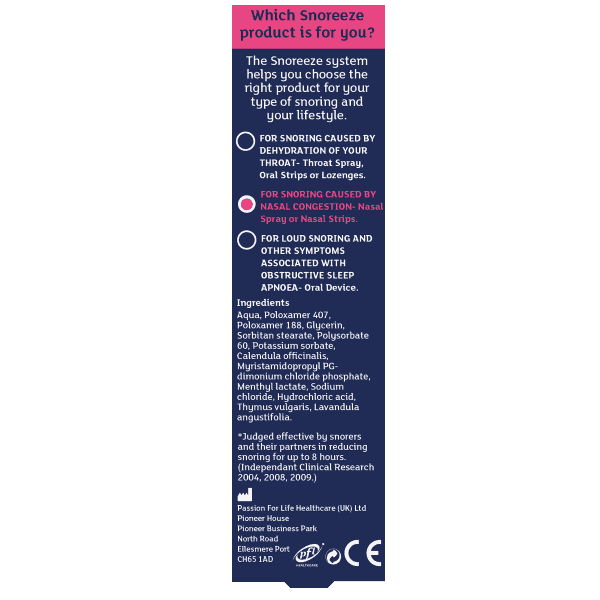 Snoreeze Nasal Spray is not a cure for sleep apnoea (a related respiratory medical condition). Aqua, poloxamer 407, poloxamer 188, glycerin, sorbitan stearate, polysorbate 60, potassium sorbate, calendula officinalis, myristamidopropyl PG – dimonium chloride phosphate, menthyl lactate, sodium chloride, hydrochloric acid, thymus vulgaris, lavendula angustifolia. Vegetal origin. 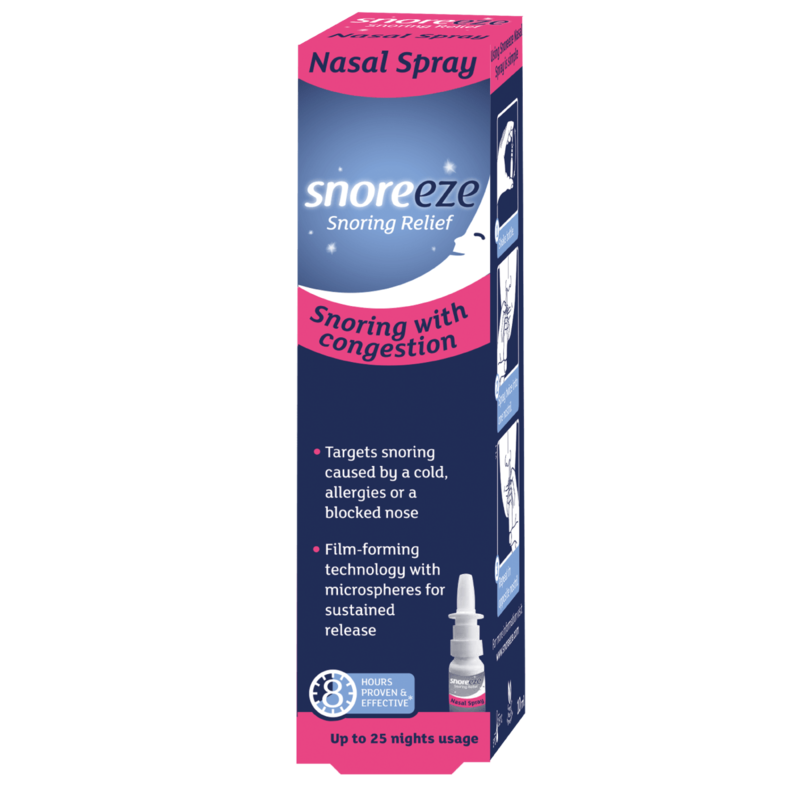 How does the Snoreeze Nasal Spray work? Colds and allergies cause swelling that narrows the nasal passages. This can result in dehydration and increase the vibrations that produce the sound we hear as snoring. 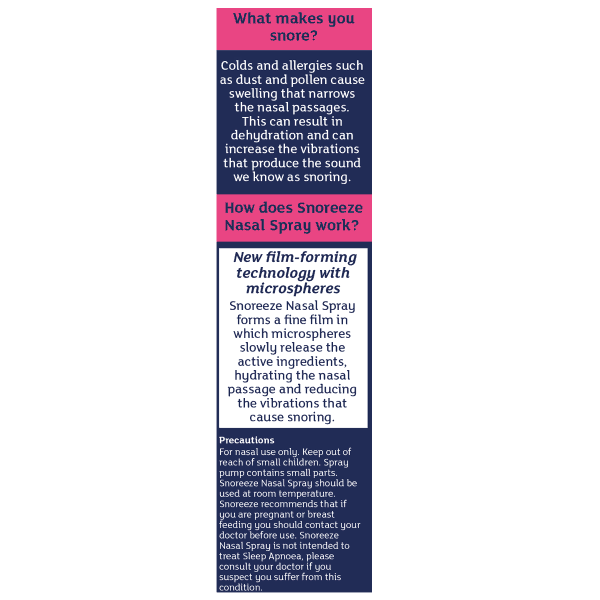 Snoreeze Nasal Spray forms a fine film in which microspheres slowly release the active ingredients. This film hydrates the nasal passages, reducing the vibrations that cause snoring for up to 8 hours. Is it safe to use Snoreeze Nasal Spray every night? Can I use Snoreeze Nasal Spray if I’m taking medication? Can I use Snoreeze Nasal Spray if I suffer from asthma or any other respiratory problems? Can I use Snoreeze Nasal Spray if I’m pregnant or breastfeeding? Snoring is a complicated problem, with many different causes. 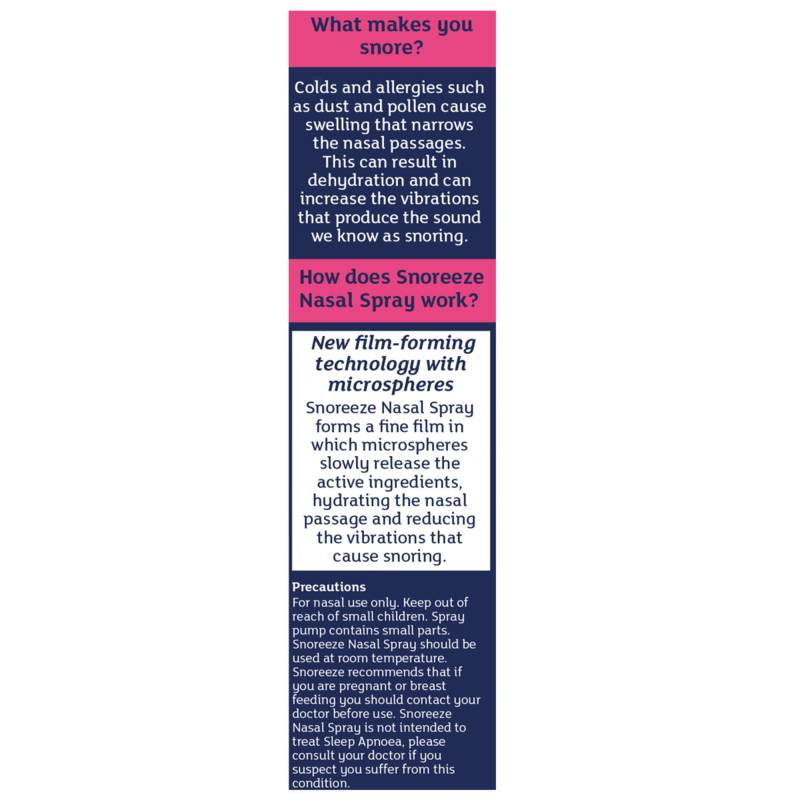 This is why the Snoreeze range consists of so many products; to try and provide a product suited to every snorer. 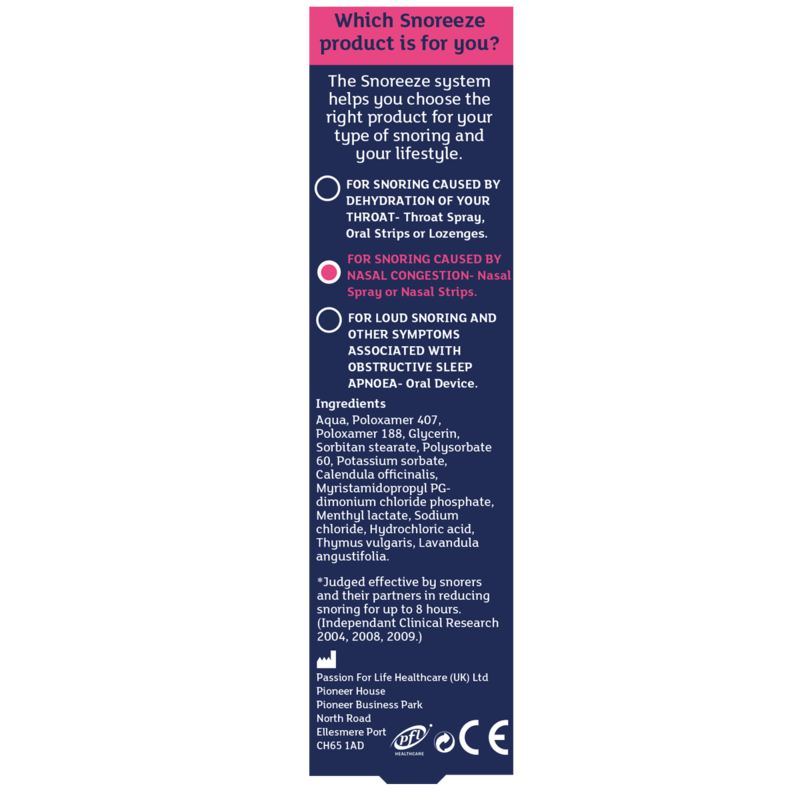 If you use a Snoreeze product and find that it doesn’t relieve your snoring, it might be that you would be more suited to another product in the range. Make sure to read the detailed product descriptions provided on the website or use the “diagnose your snoring” questionnaire before making a product choice. If you’re still having issues, you can contact our customer service team who will help you with any concerns. “Even the prescribed medication given to me by my doctor cannot in any way match Snoreeze. I get sleep, I can breathe more clearly.